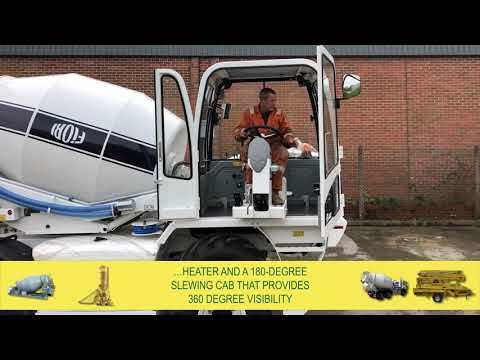 Self-loading rough terrain concrete mixers are 4x4 wheel drive trucks fitted with a front operators cab. They can climb, fully loaded with cement, over the most precarious terrains at gradients of up to 30o. Self-loading concrete mixers can load, mix, produce and discharge over 100m3 of cement per day, and its electronic weighbatching equipment ensures precise mixes of any grade of concrete with an accuracy of +/- ¼%. 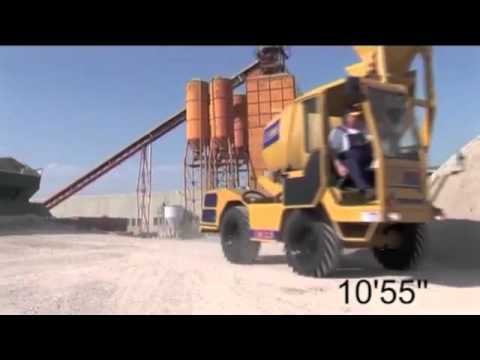 For ease of operation, Utranazz range of self-loading rough terrain concrete mixers are joystick-controlled and fitted with a 300o slewing drum, allowing concrete to be discharged from every side of the vehicle at heights of over 2m. Simple to use and easy to maintain, the concrete mixer is suited to all types of job-sites from congested city centres to remote villages. Self-loading concrete mixer trucks are available in the following sizes: 1.0, 2.0, 2.5, 3.5 and 5.5 cubic metre outputs. The drum is fixed on the 1.0, 2.0 and 5.5 models and slews through 300o on the 2.5 and 3.5 models. All models have hydrostatic transmission with ‘T’ way steering and are fitted with either Perkins, Cummins or Deutz engines.